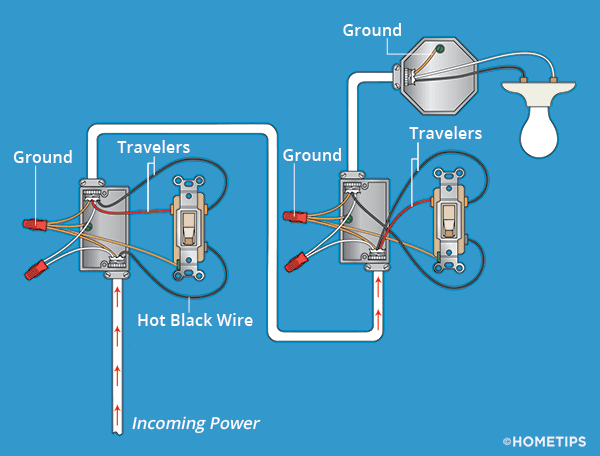 These diagrams illustrate how to wire a pair of three-way light switches in three different situations. 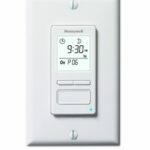 Three-way light switches, used where you want to control a light from two locations, such as from both ends of a staircase or hallway, are built and wired a little differently than a conventional single-pole light switch. For starters, they don’t have “OFF” and “ON” printed on the toggle, and they don’t have a top and bottom. Three-way switch wiring where power connects to first switch and then the light. Also, rather than having two terminal screws like a conventional single-pole light switch, a three-way switch has three. On most of these switches, two of the terminals are the same color (typically silver or brass), and the third terminal, called a “common terminal,” is a different, often darker, color. Not all three-way switches have these terminals placed in the same configuration, so you have to pay attention to their colors when wiring them. When replacing a three-way light switch, be sure to return the wires to the proper screw terminals. On three-way switches, two terminals are the same color and the third terminal—called the common terminal—is a different metal or color. Put a piece of tape on the wire that goes to the common terminal screw. The other two wires can attach to either of the identical terminals. Refer to the illustrations on this page for doing the rough-in wiring for each of these situations. Note that these diagrams assume that you’re following all recommended practices for safe installation of electrical circuits and that the power to the circuit is always turned off when you are working with exposed wires. It’s important to recognize that a light switch is designed to interrupt the “hot” wire when it’s turned off. 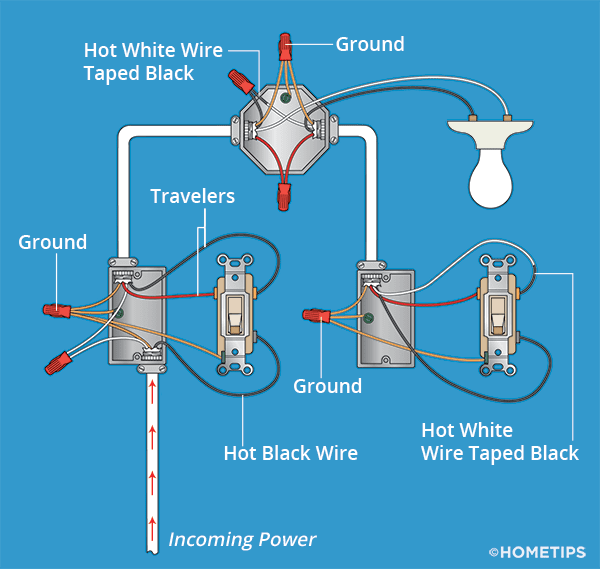 With this in mind, the white wire from the power source always goes uninterrupted to the light fixture and the bare grounding wires are always fastened to grounding screws. 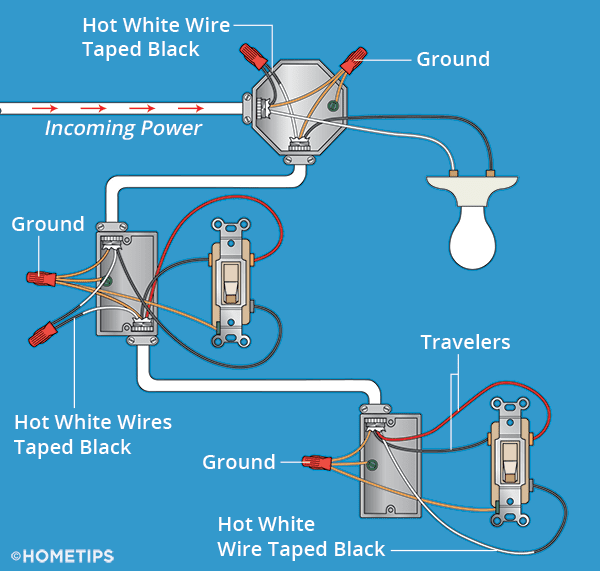 With a three-way switch, three wires connect the pair of switches—two black “traveler” wires and a third “common” wire. When the circuit’s power is turned on, any of these may be “hot,” depending upon how the switches are toggled. Because “3-wire-with-ground” nonmetallic electrical cable such as Romex contains a white wire, the white wire can be painted or taped black to serve as an additional black (hot) wire when used as the connecting wire between two three-way switches. Three-way switch wiring where power goes directly to the light. 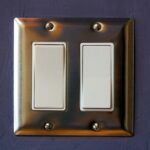 There are three basic ways three-way switches may be set up to control one or more lights. The right one for you will depend upon the placement and relationship of the switches and lights. Please note: All switches that have a green grounding screw or wire must be grounded to the metal electrical box or to the circuit’s bare or green ground wire. A) The wires from the power source may enter one switch box first, then travel to the light, and then terminate at the other switch (shown above right). B) The wires from the power source may enter the light fixture box first, then travel to one switch, and then connect that switch to the other switch (see illustration at left). Three-way switch wiring where power starts at one switch and goes to second switch before traveling to the light. C) The wires from the power source go from switch to switch, and then go to the light (see illustration at right).